A domain proxy is a system whereby a domain owner, the registrant, hides his or her details for a domain registration behind a registrar or reseller’s proxy. The proxy owner substitutes his own details for those of the registrant, the domain owner. This is a great shield for legitimate users wishing to protect their privacy, but also attracts malicious registrants using fake registration details. The malicious registrant is hidden behind the proxy and not open to scrutiny and many times endangers the privacy of innocent consumers, if not allowing them to be defrauded or harmed in other ways. Much has been posted for and against proxies. It’s our belief that the proxy protection system is needed, but that it should be done in a responsible way where the rights of innocent parties will not be impacted upon. Namecheap is an American registrar. Their affiliated company for providing proxy protection is Whoisguard. For a while now Namecheap has been in the shadows and a registrar behind bad events impacting innocent consumers. In 2010 it was Heihachi and the German fake shopkeeper gang, described at the time as one of largest cyber crimes in Germany by the media. At the time there was fears that Heihachi might very well affect the stability of the internet with constant DDoS attacks, malware and other bad events originating from this quarter. At the time the registrar responsible was eNom with the reseller being Namecheap. Heihachi was made a sub-reseller and despite providing fake registration details themselves, even providing proxy services to the malicious clients which included bot herders, carders, malware distribution websites openly, the the attackers they were harboring. The ITSEc community “regarded Heihachi as an outfit run ‘by criminals for criminals’ in the same mould as the criminal Estdomains.“. Namecheap and eNom refused to address this issue. The criminals had found an ideal layer of isolation. This saga ended up in the German and Austrian courts with the perpetrators being arrested and subsequently found guilty. The reseller owner of Heihachi already had a criminal record. This was little comfort for the victims of the crimes committed who lost their money forever. This was never looked at at registrar or ICANN level. The guilty parties were exactly as mentioned to Namecheap and eNom at the time. No lessons were learnt. Are we were doomed to see history repeat? Roll forward seven years and decide for yourself. Note: eNom has since been bought by Tucows. Namecheap now finally seems to be using their own status as registrars to act as sponsoring registrar. The new eNom has made extremely encouraging and promising efforts at stopping abuse of their services. The USA: Pet Scam Epidemic? Many people nationwide get scammed by people running bogus operations out of foreign countries, posing as USA or Canadian dog breeders selling adorable little puppies. Sue McConnell, president and CEO of the Greater Cleveland Better Business Bureau, said Carr’s situation is typical. The BBB recently has been fielding a lot of inquiries about puppy scams. 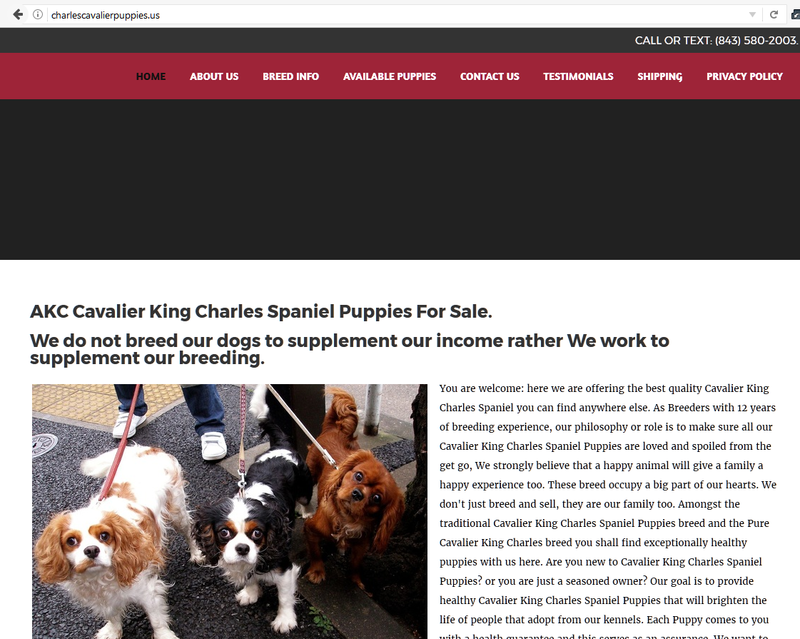 This is an extract from a recent article at http://www.cleveland.com/business/index.ssf/2017/02/beware_of_internet_puppy_scams_1.html. This article describes how a victim was defrauded in a pet scam In the report we hear how the victim tried purchasing a Maltese puppy from http://www.smartwhitemaltese.com. After paying for the puppy, the puppy was sent via a fictitious courier. The courier now claimed the crate was too small, requesting the victim rent a larger crate. This is a typical pet scam in two phases. Other excuses for trying to get victim to make further payments might be needed vaccinations, a sick pet and fictitious vet bills – there are many excuses which can be used. This is the common Cameroonian pet scam. Did I say Cameroonian? Yes, and these scammers are turning the USA into their personal piggy bank – with the assistance of certain US based domain registrars! When speaking of West African cyber crime, everybody nods, thinking of spam emails received, promising fabulous riches such as lotto winnings, promises of rewards from a corrupt bank official, solicitations to assist in investing millions of dollars, help a dying widow … the classical 419 scams. What a lovely website, but buyer beware! 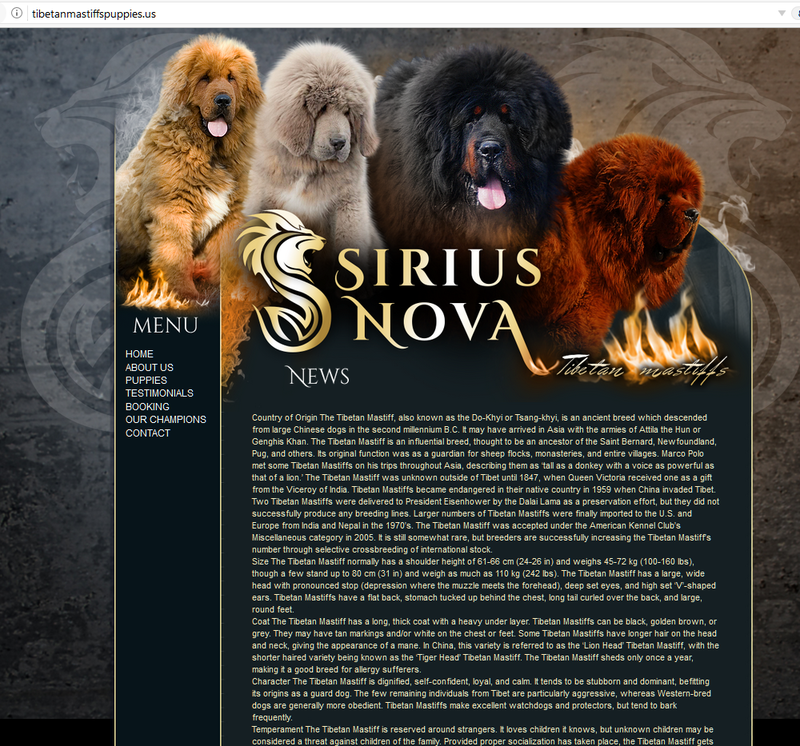 This is a Cameroonian pet scam website. We currently have coupons from our shipping agent to ship 3 puppies at no extra cost, so if you purchase your puppy while this coupons are still available and valid, we will be able to ship your puppy for free. Otherwise shipping will cost an addition $289. We see fabulous promises trying to belay the potential buyers fear. Also promises of free shipping etc via their shipping agent (part of the scam). Also a bit of pressure tactics, we only have three coupons available. In reality there are no puppies, there is no shipping agent, only misery for the potential buyer and financial loss. Always visit the breeder. Responsible breeders and rescue groups will be more than happy to offer you a tour. Search for website warning signs. 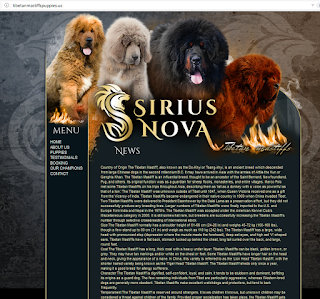 The reason fake breeder websites look real is because the content is typically stolen from another site. Look for duplicate sites by copying a line from the website into a search engine and looking for identical wording elsewhere on the Internet. Also, search for the domain name on “WHOIS Lookup.” Make sure the site is hosted in the country where the breeders claim to be located. Pick your puppy up at the kennel. Don’t rely on the breeder to ship the puppy. Check references. Talk to others who have purchased pets from this breeder and the veterinarian the breeder works with. Pay with check or credit card. If a breeder pressures you to pay by wire transfer or prepaid debit card, it is probably a scam. Many pet scams are hosted in America, while the pet scammer pretends to be in America. Yet the perpetrators find themselves far removed from US shores using US telephone numbers abusing VOIP and like providers to establish a fake US presence. Fact: Thieves lie. IP 68.65.120.217 = AS22612 = Namecheap, Inc.
It’s probably a better idea to bypass any website where the breeder can’t be verified. Unfortunately it’s not uncommon to see pet scammers resorting to phishing. They actively request you to pay via a credit card, likewise the fake courier. Once the scammers have your credit card details, they will abuse it for purchases online and have the goods shipped to mules and like. If in doubt, run! Namecheap is the leading* registrar in the world used to sponsor domains used in advance fee fraud. More worrying is that this is not of concern to them and they are quite willing to profit from the domain sales, even up-selling by adding their associated Whoisguard proxy protection in place to protect the identity of the domain owner. Then they self blind to legitimate complaints leaving a wake of victims unable to enforce their rights while trivially losing their privacy. We will shortly see how it plays out in reality. Quite a feat to change countries halfway through a domain registration. We need to ask how this domain was ever registered. It shows a total breakdown of any form of authentication and/or checks. Just for fun: we mentioned the Cameroonian family of scams is distinct from 419. Consider the domain gentlepressltd.com used for a commodities scam, claiming to sell biodiesel and vegetable oils. But back on track. Dare we mention “Melida Sin” is also trashing another .US domain to scam American consumers, sponsored via US registrar Namecheap? 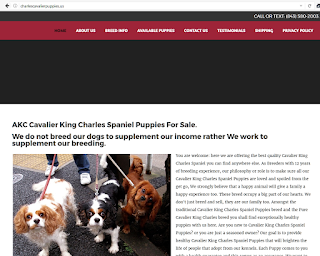 http://charlescavalierpuppies.us/ and hosted in the USA? Yet it’s these very same malicious registrants that also make their way into the .com, .net and other registries that allows proxy protections, causing much harm. Any sane reader may assume that Namecheap would revoke such a registration if they became aware of the a domain. After all, a registrar is a custodian of trust? Apparently not. 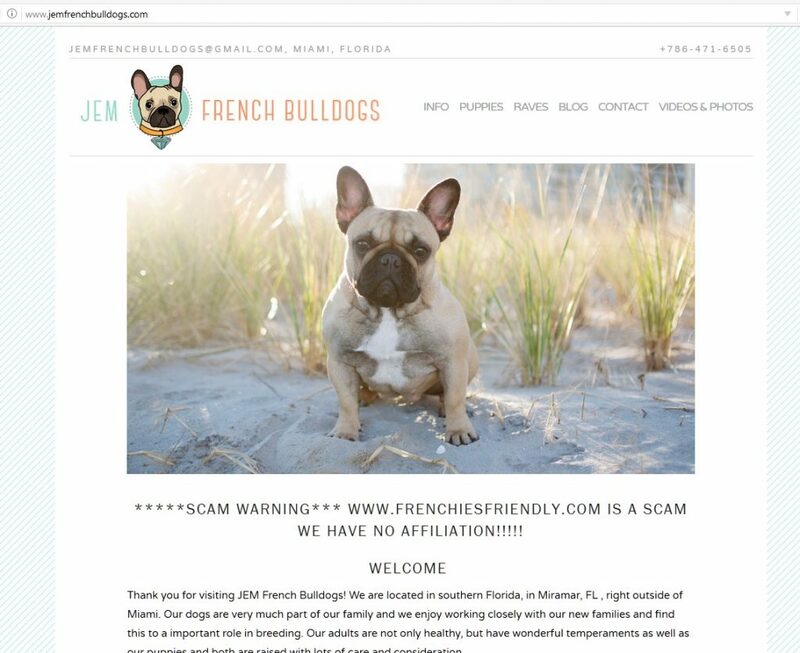 This domain is scamming people pretending to own dogs for sale and it stole my identity and everything on my site.The site is fraudulent and it’s causing a problem for me (owner name) the owner of JEM French bulldogs. The site has stolen all my text and images as well as copyrighted photography. please visit the following website: http://www.whoishostingthis.com/. I’m following this incident. Further I’m also bcc’ing certain interested parties. I find your response (included below) totally inappropriate and in conflict with your stated terms of service. A domain should not be anonymous, you should have the registrant details recorded. An anonymous domain registration is the .com gTLD would be in violation of stated ICANN policies and not allow for accountability.neither is WhoisGuard typically in a position to adequately investigate such claims and pass judgment on the relative merits involved. You will notice that frenchiesfriendly.com is the domain under your protection, that (owner name) is the owner of jemfrenchbulldogs.com and the person contacting you about the malicious domain infringing on her rights. This becomes important later below. Furthermore, as a domain proxy you should be adequately familiar with domain registration dates. As such the claimed legitimate domain jemfrenchbulldogs.com predates the domain frenchiesfriendly.com you are giving protection. 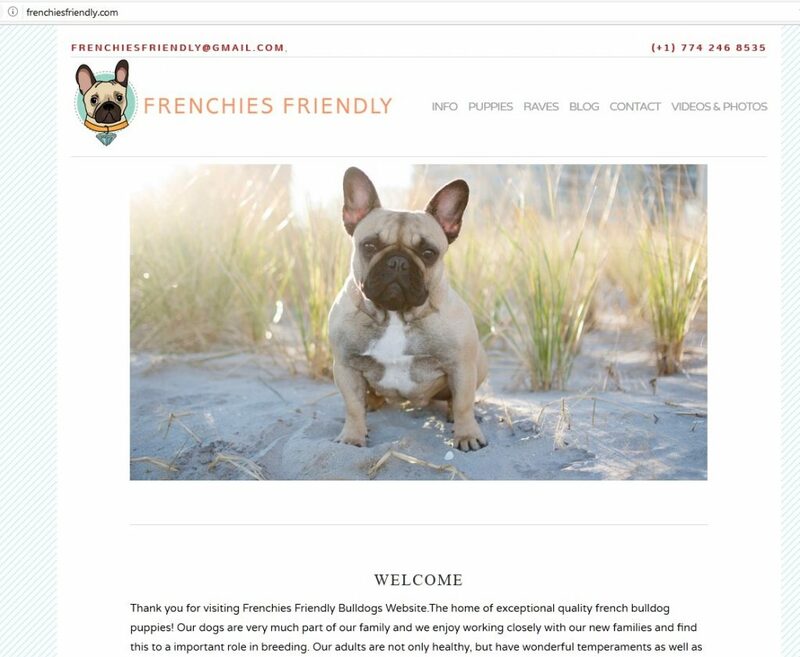 https://web.archive.org/web/20160331170254/http://www.jemfrenchbulldogs.com/ – note the date, 2016/03/31 – before the domain frenchiesfriendly.com was even registered. Note the email address clearly visible on the original: jemfrenchbulldogs (at ) gmail.com – the party using that email is the one originally bringing this matter to your attention (owner name). As such there no no room to doubt any claims made by (owner name). All the evidence is self substantiating and no investigation is needed. As such you have no excuse for not revealing the identity of the hidden registrant, unless you wish to accept liability for the harm? Please be as kind as to advise on your decision promptly. Doing anything else would just be putting innocent consumers in harm’s way and at the risk of losing their privacy, as is already the case with (owner name), who is being contacted by victims to frenchiesfriendly.com and called a scammer etc. Just in case you are considering it – this is not a UDRP issue either. The specific type of case described here was discussed in certain ICANN working groups. Such relief is totally inappropriate and does not scale. Simply having the hosting suspend sees these domains hopping from hoster to hoster. Currently we see resellers in offshore jurisdictions hosting fraudulent websites ignoring any abuse reports, using your protection. This pattern is rapidly increasing. I have sought the permission of (owner name) to share her story publicly, and if such is given, I will be publishing about this specific incident, showing how a registrar and their proxy services can deprive innocent victims of privacy etc. No reply was ever forthcoming from WhoisGuard and the malicious domain is still scamming with the stolen content. However Namecheap was quick to respond (ticket #CWG-996-86193), passing the buck, despite being the registrar and as is the norm for them. Thank you for the informing us on your communication with WhoisGuard. In case we receive a request from a law enforcement authority of the United States, we will assist them in their investigation. If we receive a US Court Order regarding the domain, we will comply with any decision stated therein. Please contact us back if you have any questions. Thank you for copying Namecheap on your note. You may have advised the complainant, (owner name), on this but the course of action that will remove the content at issue is the DMCA Takedown Notice. It was designed specifically for a copyright owner, such as in this case, to use in order to empower a service provider to take action against infringing content. (Owner name) can simply serve the notice on the hosting provider and tell that the entire site is a mirror copy of their own. They do not need to name the registrant of the domain (which may be different than the hosting customer’s name); they just need to reference the domain. This allows the provider, without investigation, to take action. Registration dates alone do not establish who owns the content. However, the DMCA Takedown Notice requires the complainant to attest that the content is theirs and the service provider may rely on this. Action must happen at the hosting level or the content can be moved from one domain to another. The hosting provider is the only source that controls the content. Here, the hosting provider appears to be OVH and their abuse email address is: abuse@ovh.net. Finally, we do confirm that the information provided by WhoisGuard is accurate. They have no access to content, nor the ability to determine who had the content first. However, we do believe that DMCA Takedown will help (owner name) stop the alleged infringement. This clearly shows that, despite evidence of harm being shown, ICANN RAA clause 3.7.7.9 just flew out the window. Harm is being done as we can see. Also trying to make this a purely DMCA issue is at best disingenuous – this is a fraud issue. Innocent trusting people are buying pets that do not exist, getting defrauded. Namecheap sister company WhoisGuard accepted responsibility for this domain, yet when the time came to take up responsibility, disavowed it. Ticket #PMSJTXVGDF to reference it. as it is not managed by us. So who do we pass the buck to next? And this, ladies and gentlemen, is why the USA and the rest of the world has a pet scam problem. Literally thousands of these domains are registered annually, abusing the marks of anybody that may make them look more legitimate, even those of IPATA, AKC and the BBB, stealing credit card details, causing further secondary losses for banks and like. The credibility of the internet is being undermined one malicious domain at a time. Namecheap has received reports of fraudulent websites where the victims were even visible, being deprived of there privacy since the websites were bogus, using Namecheap domains, yet receiving the same template “We are only a registrar” response. At least one such domain was suspend at registry level after drastic intervention and massively exposing victim details in an international fraud. All the other abused registrars were quick to mitigate, only Namecheap was obstructive as is usual. It’s our belief it’s for this reason we have seen a drastic growth of serial fraudsters running to the protection of Namecheap after being suspended by and booted from other registrars. Dirty, rotten, stolen money goes where it’s welcomed. If you have been defrauded by the website on domain name FRENCHIESFRIENDLY.COM from start of March 2017, you may have a legal claim against WhoisGuard. Please consult your lawyer or legal representative.